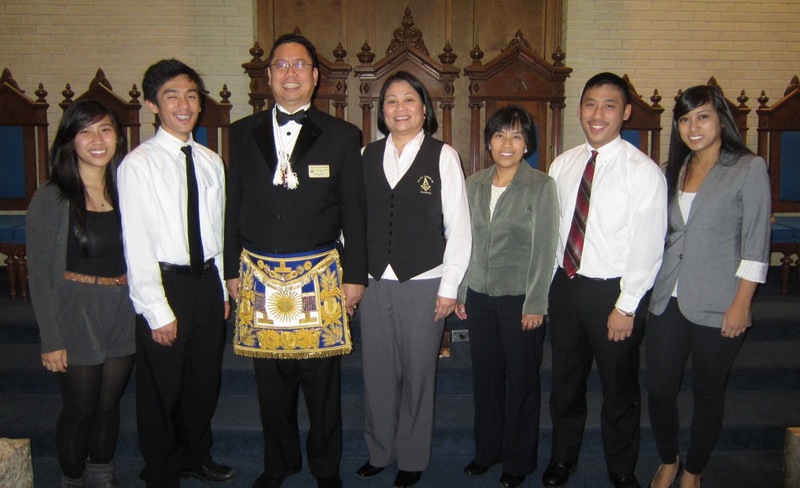 On November 29, Tuesday, Winnipeg Chapter, Order of DeMolay conducted an excellent Majority Service for RWB Dave English, who was Initiated into Winnipeg Chapter in 1955 and Bro Justin Lapiña, who was Initiated into Winnipeg Chapter 50 years later, in 2005. It was very special that Bro Jared Lapiña, Master Councilor, presided over the Majority Service for his older biological, DeMolay, Masonic and Shrine Brother. Before the Chapter Meeting, RWB Dave English, LOH, who is on the right in the picture, is seen conferring with MWB Jack Fergusson, LOH. It was great to learn that RWB Dave joined Winnipeg Chapter in 1956 and MWB Jack joined the same in 1945. Here are some of the Chapter Members before the start of the Meeting. After Majority Service, MC Jared Lapiña turned over the gavel to RWB Dave English, who presieded over the Investiture of the Legion of Honor on Past EO Richard Rosin and MWB Chibu Uson. The Designates are shown here taking their Obligation as Legionnaires. The new Legion of Honor Awardees after receiving their Cordon and Medallion. A red Cordon is for an LOH Member who is a Senior DeMolay while a white Cordon is for one who is not a Senior DeMolay. L to R: RWB Dave English, LOH, Active,who presided over the Preceptory and who was a recipient of the Majority Service; Past EO Richard Rosin, newly Invested LOH, Active; Bro/PMC Justin Lapiña, recipient of the Majority Service; MC/Bro Jared Lapiña; MWB Chibu Uson, newly Invested LOH, Honorary; and MWB Jack Fergusson, LOH, Active. A picture with a Masonically active family, the Lapiñas. L to R: PHQ Jasmin Lapiña, PMC/Bro Justin Lapiña, MWB Chibu Uson, Sis Mae Uson, Sis Espie Lapiña, MC/Bro Jared Lapiña and PHQ Jachin Lapiña. The Lapiña missing in the picture is RWB Neil Lapiña, who is working in Calgary. After the Meeting, there was a Refreshment Hour. Receiving the LOH was a very humbling experience. Rest assured that I will proudly wear the LOH Cordon as I do my Masonic Apron and will continue to do my best to make a positive difference. On November 10, Thursday, I joined a group of 10 Active DeMolays and Advisors of Winnipeg Chapter, Order of DeMolay, in traveling to Burlington, ON for the DeMolay All-Canada Conference. We were at the new James A Richardson International Airport in Winnipeg before 4 AM (yes, that is 4 AM) for our 5:10 AM flight to Toronto. 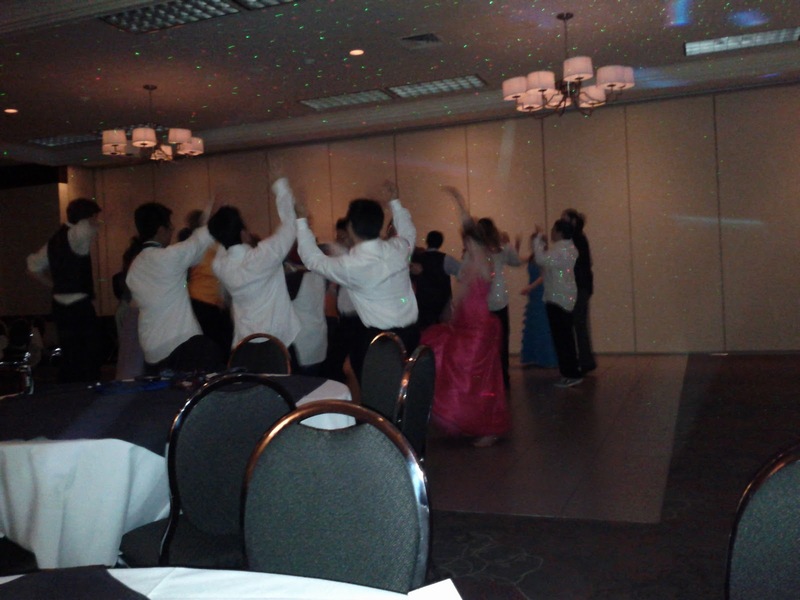 I know that some of the DeMolays actually did not get any sleep at all on Wednesday night due to the excitement of attending the Conference. Our flight was delayed slightly in taking off because the plane needed to be de-iced. The flight was uneventful. I planned to sleep during the 2-1/2 hrs flight but I watched the movie "Captain America", which was one of those available in-flight. It was a great movie and I am looking forward to the sequel(s). Upon landing in Toronto, I called our Toronto Cabletow Brethren who were picking us up and bringing us to Burlington to inform them that our plane has landed. Within a few minutes after claiming our baggage, we were on our way to Burlington. The Conference was at the Burlington Hotel & Conference Centre (part of the Holiday Inn chain of hotels). We checked in and looked for a place to have our first decent meal of the day. As it was just 10 AM, there was no place nearby for brunch or lunch. We then decided to proceed to the East Gate Mall in Mississauga for some Chinese or Asian food. East Gate is not a typical restaurant. It has a number of food stalls. They had no menus but each food stall had pictures of the various meals, which were very large servings in woks at very reasonable prices. Only those who had really good appetites finished their food. Brother (DeMolay, Freemason and Scottish Rite) Joey Minor III, the State Master Councilor of Illinois, joined us for lunch and at our side trips that afternoon. On Thursday evening, I had a wonderful dinner with DeMolay International Grand Junior Councilor Dad Mike Salazar, his wife, Janet, DeMolay Canada President Dad Ernie Loiselle, his wife, Linda, Ontario Provincial Chapter Dad Dave Doherty and his wife, Maria. After dinner, the Ontario Provincial Chapter was opened by Provincial MC Andrew McDonald. The visiting Provincial/State Master Councilors were received. Our MC Jared Lapiña represented Manitoba DeMolay. Also presented was Dad Mike Salazar, DeMolay International Junior Grand Councilor and Executive Officer (EO) for Northern California and Hawaii. 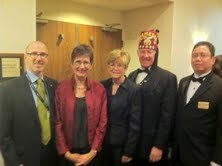 They also presented the Grand Master of the Grand Lodge of Manitoba, who is also the EO for Manitoba. The last Dignitary to be presented was Dad Ernie Loiselle, EO for Ontario. Here is Provincial MC Andrew and those sitting in the East. The Initiatory Degree was then excellently conferred on two Candidates. Three (3) Winnipeg DeMolays participated in the Degree as Preceptors: Scribe/PMC Mikey Uson, 1st Preceptor; DM Arnold Calambacan, Jr, 3rd Preceptor; and IPMC Kristian Regalado, 5th Preceptor. 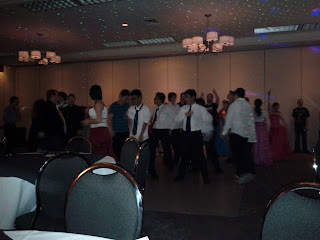 They and the DeMolays from Ontario and from other Jurisdictions did an excellent job in conferring the Degree. Here is a picture taken after the Chapter Meeting was called to refreshment. The Winnipeg DeMolays were exceptionally hungry after the Meeting since they did not have dinner due to the very big lunch earlier that day. So we brought them to the nearby Boston Pizza where they quickly devoured three (3) large pizzas. Then everyone got a well deserved night's rest. Although some of the DM's still horsed around for a short time before finally crashing to get some zzz's. On the beautiful fall morning of Remembrance Day, all the participants rode on one of two (2) school buses which brought us to the Royal Ontario Museum in Toronto. Waiting at the main lobby for the Museum tour to start. Here is a picture of the beautiful ceiling of the main lobby. Here is another picture of the beautiful ceiling. Here is picture of our group's tour guide. It was no surprise that the DeMolays and Advisors found the exhibits about the knights very interesting. Lunch at the Museum cafeteria. Waiting to ride the bus back to the hotel. It's curious that one of the plugs from Mikey is in Dreden's ear and vice-versa. How can they listen to two (2) different songs at the same time - one in each ear? PMC/Bro Justin Lapiña arrived from Winnipeg that Friday morning and joined us at the Museum. Here we are on the bus back to the hotel. We had a chance to take a closeup picture of the CN Tower that afternoon. The Winnipeg DeMolays showing the Winnipeg sign (except Scribe/PMC Mikey, 2nd from left). After dinner, the contestants for the Provincial Sweetheart were introduced and the interview portion of the contest was held. Then there was a Competition of the DeMolay play. Here are the judges for the said Competition. Our own Dad Rico Villarin was one of the four (4) judges. 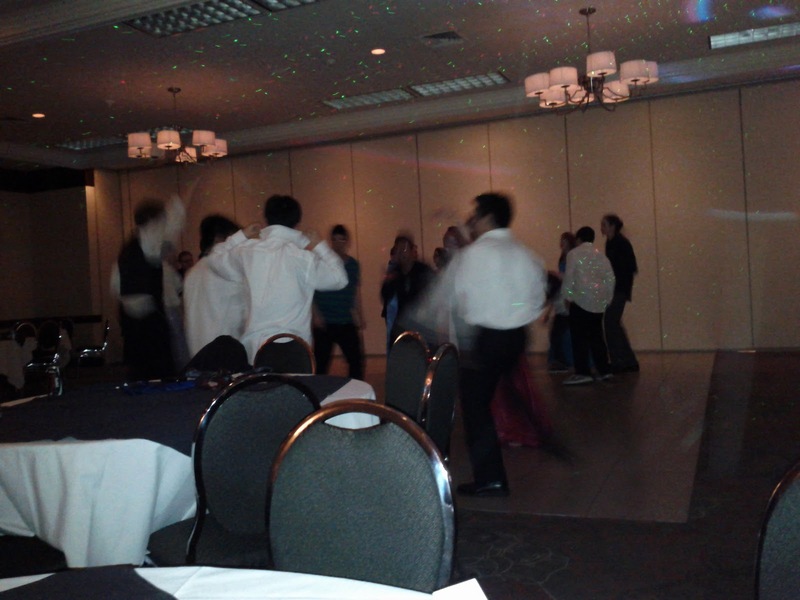 Ottawa Chapter was the clear winner of the DeMolay play competition. Their memory work and delivery were perfect. They even had lighting and background music. Very, very, well done! I wonder what our MC Jared is so happy about. It might that he enjoyed the dinner and the competitions. This is DM Dreden Gomez doing his happy face. Rested, fed but still with a lot of adrenaline pumping, our DM's played basketball with DM's from Ontario and Alberta. I think it was around 10 PM and about 5°C. RWB/Dad Junn Manalang, Dad Rico and I were picked up by Bro Flor Rodriguez to meet up with Bro Edwin Manalo. We had a late dinner at a Chinese restaurant - congee, fish and two (2) types of fried rice. Lots of carbohydrates there! Then back to the hotel for much needed zzz's. On the morning of November 12, Saturday, there were competitions for the various talks. We then proceeded to the Playdium in Mississauga. In this picture, we were waiting to enter the Playdium, where we had lunch before playing the various arcade video games available. Dad Rico Villarin testing his driving skills. Pinball time for Dad Brian Langtry. This is Dad Bill Millet, EO of the Atlantic Provinces, testing his flying skills. Our MC, Jared Lapiña, was really tired after two (2) hours of playing various arcade video games. Before the Saturday Banquet, I met Imperial Sir George Mitchell, Immediate Past Imperial Potentate of Shriners International. The East during the Banquet. The various Chapter Sweethearts and Contestants for the Provincial Sweetheart before the Installation of the Provincial Chapter Officers and other ceremonies. The Installation Team at the Altar. Provincial MC Andrew McDonald presiding over the Installation of Officers of the Provincial Chapter. The various Dignitaries were presented. Some joviality among the Dignitaries in the East. The Incoming Officers of the Provincial Chapter led by Zane McLeod, Incoming Provincial MC. Bro Zane McLeod taking his Obligation as the Provincial MC. Newly installed Provincial Master Councilor Zane McLeod. The gavel was turned over to Dad George Ingraham for the Investiture of Imperial Sir George Mitchell with the Honorary Legion of Honor. Imperial Sir George Mitchell being invested as an Honorary LOH. New Honorary LOH giving his remarks. And then, we went back to our rooms to get some zzz's. On November 13, there was a service in memory of Dad Frank S Land and a Remembrance Day ceremony. After those, there was a fundraiser by the Sweethearts - makeovers of selected people. One of the volunteers was Dad Dave Doherty, Provincial Chapter Dad. Winnipeg Chapter had MC Jared as our volunteer. He raised about $120. In this picture and those following, the Winnipeg Brothers assist in giving MC Jared a makeover. In this picture, Dad Rico helps give Illinois State MC Joey Minor III a makeover. Here is SMC Joey after his makeover. 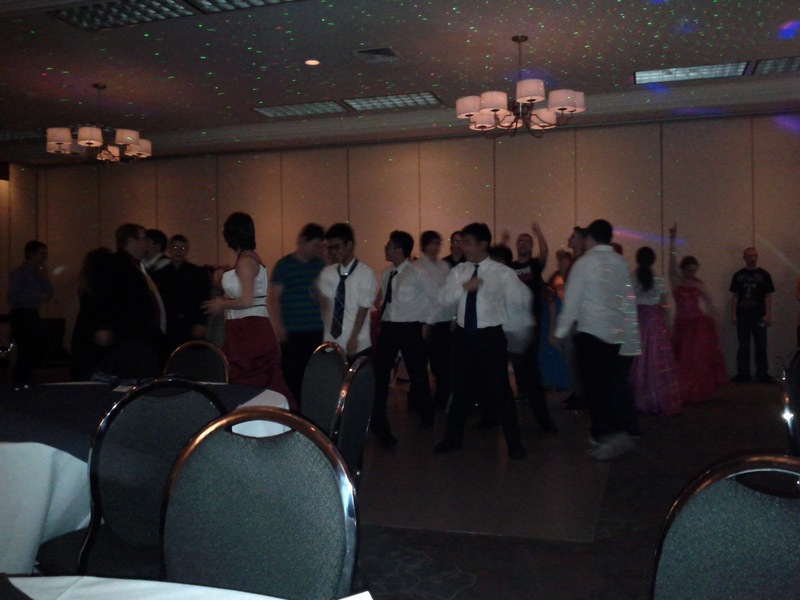 The Winnipeg DeMolays and Dad with MC Jared. Here are all the volunteers after their makeovers. Dad Dave Doherty with Ontario Provincial MC Zane McLeod. The DeMolays wanted to go shopping so we were brought by the Toronto Cabletow Brethren to Square One in Mississauga. Here are pictures taken just outside the mall before we proceeded to have dinner. We had a very sumptuous buffet dinner at the Mandarin Restaurant. Thanks to our hosts, Bros Flor Rodriguez, Edwin Manalo and Alvin Tansingco. After dinner, we were brought to the airport for our flight back to Winnipeg. We all had a very wonderful time in Ontario. Thanks to everyone who made it so.